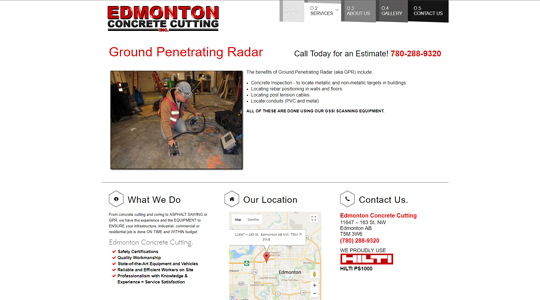 Edmonton Concrete Cutting is operated by some of the hardest working people in the business. 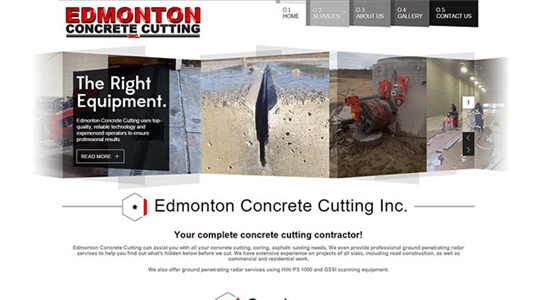 Specializing in Asphalt and concrete cutting, egress window installations, ground-penetrating radar scanning and related services, owner/operator Lance Larson needed a prominent and high-contrast CMS website built with his niche market and brand identity in mind. Using WordPress as a strong base from which to build, we constructed an excellent representation of what Lance was seeking, Clear rand concise, easy to read, intuitive navigation, and direct visual access to the contact information his customers need to start calling. Modern, clean, and minimalist design and informational layout with clear service descriptions, emphasis on short-n-sweet. Lance and his team are cut-to-the-chase and their refreshing straight-forward approach of the website layout and content flow are direct reflections of that. Naturally, grey and concrete-like elements form part of the overall composition, and complimentary, high-contrast reds and black to provide definition and pull the overall theme together. Even on websites that are relatively short and by all appearances ‘simple’ still require the same attention to detail and brand identity design strategy. 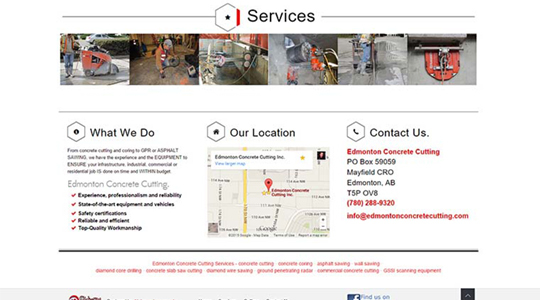 A WordPress content management system was also selected as the foundation for this website build to afford Lance and his team the ability to make ongoing edits in-house, with relative ease. 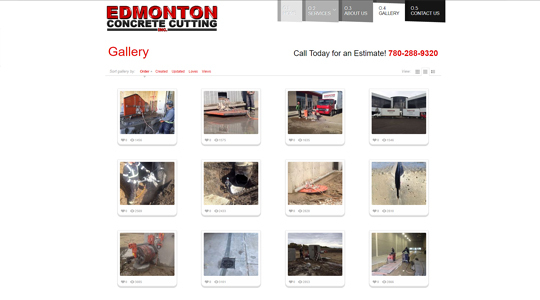 While a fairly commonplace item, implementing a photo or image gallery on a website is a great way to provide a level of interactivity and enhanced user experience. Showcase products, ideas or portfolios on your content management website in a visually appealing way using custom website development solutions or third-party plug-in options. Literally thousands of configurations already exist for image galleries and custom solutions are available for that ‘just right’ presentation. Probably one of the most often implemented methods of contact on a website, Google maps integration with your content management website is an excellent way to provide users with a clear location, and the powerful features of Google Maps. Zooming, dragging, informational features and more can be enabled as well with the overall effect giving users a further level of control and interaction with your website. Contact us for more information about how Alchemy Imageworks can inject additional interactivity and functionality into your current website.